What is so special about a basket of eggs? The unique beauty represented by each egg is inspiring. Different sizes, shapes, colors, and hues. So like God. So like Him to woo us with His creativity and attention to detail in every aspect of our lives. Until I began raising chickens, I had no idea eggs came in any color except white and light brown. No idea. Until I began raising chickens, I didn’t understand the concepts of the phrases “The head hen”, “Working out their pecking order”, or “The cost of chicken scratch” either. It has opened up a world of understanding and awe to see how God created each breed of chicken to stand apart for various reasons and then, to keep us all guessing, He decided to vary the egg color as well. There are some different breeds who have very similar looking eggs, but there are dozens who produce eggs that are as varied as the colorful patterns of their feathers. 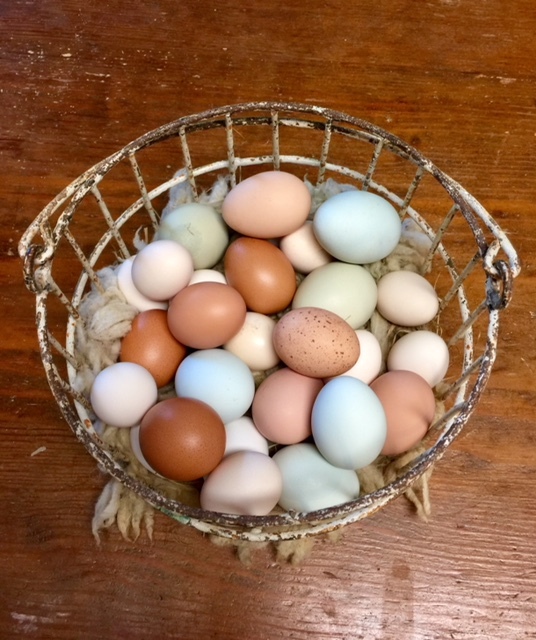 Just moments ago, I shared with a friend that I know that God could have just made all chicken eggs the same color and still have been impressive in the area of creativity; however, He chose to wow us with the beauty of the different colors. He wants us to be wowed by his creation. He created it for us to bring us pleasure and help meet our need for beauty and peace in a sometimes-not-so-beautiful world. It is His desire for us to take note and know that He loves us enough to create beauty for us to experience in our daily lives. Moments ago, I got off the phone with Brave Heart and Beautiful Soul. They are currently on week five of their honeymoon and are experiencing the spectacular beauty of the Austrian Alps. There is nothing like the snow-covered mountains with breathtaking waterfalls rushing down the steep sides at every glance. The crystal clear water of each lake and stream rushing alongside the mountainous roadways. The man-made castles nestled into every nook and cranny of The Alps only serve to make the views more surreal. Those images are indelibly imprinted in my brain from my many escapades through Europe during my 20s and before the days of cell phones and good cameras to permanently capture the beauty. More than the scenery itself, I remember the way I felt when gazing upon the varied and breathtaking landscapes of Europe. Sincere awe. Wonder at the spectacular beauty. Disbelief that anything on Earth could be so breathtaking. Desire to live among its beauty. Hopeful to experience it again. Longing to imprint the images I was able to witness first hand. Thankfulness for the opportunity. Desire to share it with others. My travels in Europe and my lifelong love of animals and nature have inspired me to write blogs and take pictures about my interaction with God, nature, and the beauty of this world. Yes, I am fully aware that our world is full of many dark and sinister things along with dark and sinister people, but my habit in life has been one of focusing on happiness and joy whenever possible. I have also chosen to tackle issues truthfully and honestly while remembering to be thankful for God’s grace and the beauty He has provided for me and my family. Sometimes, I wonder if people think I am too much like Pollyanna and don’t want to face unpleasant situations in life. Trust me, I have been thrust in the middle of many unpleasant situations and many unpleasant people throughout my life and feel that it is a gift God has given me to force myself to look at life lessons and how to change things rather than the frustrations of each person or situation. Back to the eggs. I have always been amazed by the creativity of God. The animals He designed for our benefit and pleasure are a source of constant amazement and entertainment. The trees He designed for different climates and different reasons are spectacular. The birds. The fish. The people. You get what I am saying, I’m sure. The obvious similarities are there, but the differences are striking and beautiful and what sets them apart. The people. Yes, the differences can be a constant source of frustration for all of us. Yes, the differences seem to be the cause of a lot of problems in America at the moment. Yet, those same differences are what makes our world beautiful, special, unique, different, and memorable. Can we agree on our differences and put them aside for long enough to see the beauty in one another? Apparently, it is beyond most humans’ capabilities to embrace differences without condemnation, accusations, and outright hatred. I have frequently told my students and my own children that it takes way more energy and self-control to not be hateful, not use curse words, and not spew vile opinions out of your mouth than it takes to lose control of your tongue, your thinking, your temper, and your reactions. It is literally exhausting to not say what you are thinking, not tell some people off, and choose not to get involved in the current hot topics. Unless you truly think that you can make a difference in the way another person thinks or feels, it is best to just keep your ideas and opinions to yourself. The only way a person wants to hear what you have to say is if they directly ask you what you think. I have opinions on a lot of topics, but it will do no good to air it to a hostile audience. My opinion is only valued by a person who wants to hear it. Period. You can’t make a person listen. Especially with their heart. I have told my children and my students that there is nothing more scary than an unteachable heart. If a person is unteachable, they can be a genius in any given field and never succeed in life. Many of you who know me or read my blogs regularly will know that my thoughts run deep. My brain is always running at a very fast clip. My mind is always searching for answers to life’s problems, but unless I am teachable, my constant thoughts are a moot point. My prayer is to be teachable. Always. To my dying day, let this lifelong classroom teacher have a heart that is truly teachable. That is what a basket of eggs teaches me. How about you?